Very personable and friendly bedside manner. Cares and listens to your concerns and answers questions thoroughly. Extremelyknowledgeable and professional. Felt I was in excellent hands!! It went alright. I had something on my lip and I wanted it removed before the holidays and we got itremoved! My dad who was in the room with me said he was personable and he put him at ease. I only wish he provided a more solid answer to what the bump was so maybe I can figure out how to avoid getting anymore in the future. I went in without insurance and I paid less than I thought I would pay ?? It went alright. I had something on my lip and I wanted it removed before the holidays and we got it removed! My dad who was in the room with mesaid he was personable and he put him at ease. I only wish he provided a more solid answer to what the bump was so maybe I can figure out how to avoid getting anymore in the future. I went in without insurance and I paid less than I thought I would pay ?? 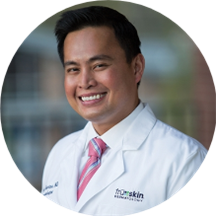 Dr. Gavino is a Board Certified Dermatologist, Dermatopathologist, and Anatomic and Clinical pathologist. After attending the University of the Philippines College of Medicine, he completed a pathology residency at UT Southwestern in Dallas and a Dermatopathology Fellowship at The University of Alabama at Birmingham. Dr. Gavino then completed his Dermatology residency at the University of Texas at Austin. He is a diplomat of both The American Board of Dermatology and the American Board of Pathology. Dr. Gavino is a fellow of the American Academy of Dermatology and of the College of American Pathologists. Dr. Gavino performed a very thorough exam; I feel confident about regular followups in the future. I had a outstanding first appointment with Dr. Carlo Gavino. Dr. Gavino embodies the best attributes you could want from your doctor. He is very personable – easy to talk to, thorough, and knowledgeable. He took his time making sure Ihad all my questions answered and genuinely seemed to be concerned with providing the best of care. It was great being able to get a complete consultation a pleasant environment. Wonderful experience. Great bed-side manner. Very professional. The doctor was friendly. I wish I would have been provided a gown instead of having to lift my shirt with three people in the room, but it wasn't the end of the world or anything. Also ZocDoc did not linkto their office files, so they didn't have my appointment on the books.